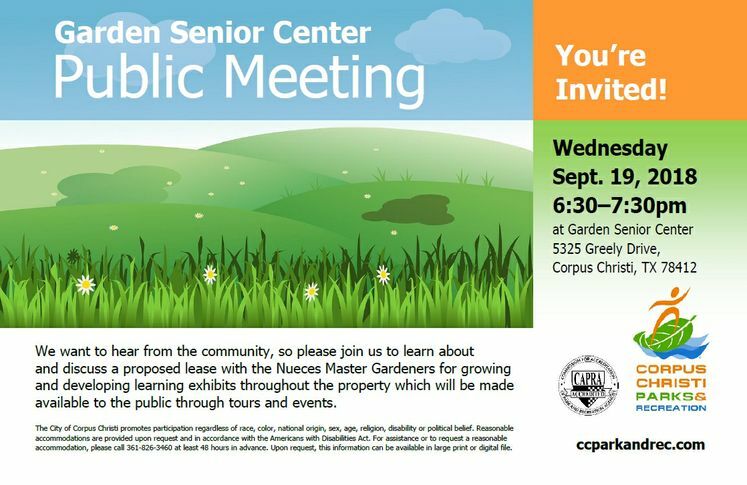 CORPUS CHRISTI, TX – The Corpus Christi Parks & Recreation Department will host a public meeting for a discussion of park use and proposed lease with the Nueces Master Gardeners for growing and developing learning exhibits throughout the property which will be made available to the public through tours and events. The public meeting will be held Wednesday, September 19, at 6:30 p.m. at the Garden Senior Center located at 5325 Greely Drive. Department representatives want to hear from interested community stakeholders regarding this proposal. For more information, please contact E. Jay Ellington, Director of the Corpus Christi Parks & Recreation Department, at (361) 826-3464 or JayEll@cctexas.com.